Working on advice from a team with demonstrable results in certain cases, the approach involved writing a number of articles of generic interest on a given subject. Within them was included a link to 2 or 3 sites as examples of particular aspects covered, amongst which was one to our site. These articles were then submitted to a range of online publications. The purpose behind all of this was to boost external references to the site, using particular phraseology (ie the chosen search term) and an associated link, all with the intention of encouraging Google to recognise the validity of the site and boost our position in search results. “Did it work?” I hear you ask. In a word, “no“. In two words, “not yet“. Will it? Don’t know frankly, but I’m not holding my breath. The problem we have with this whole SEO thing is we’re told so many things about what has to be done, and yet the best SEO is supposed to reflect the natural shape of things to have a lasting, positive effect on your search result rankings. My point is this: if Google’s search engine, as an example, is meant to reflect the natural shape of things, how come we spent 3 months, at what would have been not far under £1,000 at normal SEO rates, to manipulate the natural shape of things so that it looked like the natural shape of things? I mean we must have mimicked it perfectly, because apart from lightening our bank balance it made no difference whatsoever. 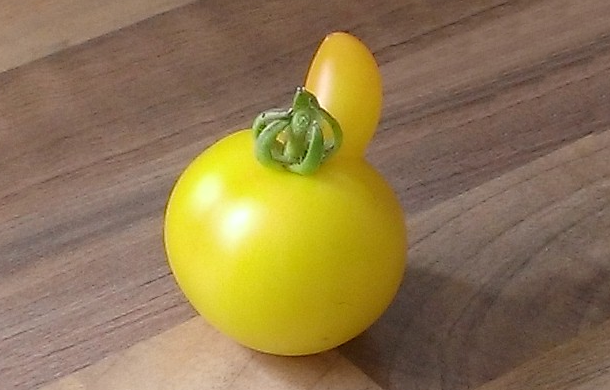 If this photo was taken as the natural shape of things, would Google classify the tomato as a “root” vegetable? So search engines use algorithms to sift through the millions of websites to try and gather a picture that means when you search for something you see relevant results. But this is clearly far from infallable. The fact that under the search criteria “web design in Milton Keynes” the DIY store B&Q appears before we do makes my point. I mean I’ve heard of self-build websites, but B&Q?? Furthermore as a team of professional web designers and developers, we recognise that certain things should be done to make the most of your site. But many changes to the algorithms by Google seem to be about moving the goalposts to keep the SEO witch doctors on their toes, rather than benefitting the general public who use the search engine. The recent mobile algorithm update was a positive exception, as mobile users genuinely benefit from mobile-friendly results. Our conclusion in all this is to take care before spending out on SEO services from the very people it appears companies like Google are trying to thwart. It’s probably up to each of us to put the witch doctors out of business, then perhaps the search engines genuinely will be able to reflect the natural shape of things.